It is what it is. How many times have you heard that? How many times have you accepted it and found peace in it? Embraced it, maybe? I can etch in several check marks next to the first two questions. Got a low score on an exam? Welp, college professors rarely ever allow re-takes, so my score is what it is. Messed up an order at one of my old jobs? Thankfully, food can be re-made, but the customer still experienced the mistake and may hold an unpleasant memory associated with the restaurant, and that is what it is, whatever it may be. Realized it is actually physically impossible for me to graduate on time (which would be at the end of this school year)? The classes I took, I took. The grades I earned, I earned. The schedule I set, I set. I will graduate when I graduate (in March 2019) (also, sorry, Mom and Dad). My sweet tooth tells me that I should be fully able to embrace these decadent dark chocolate treats, yet something else in me critiques the way they look. I work my azzzzz off to make my recipes look appetizing, and I usually employ the help of my best friend (the famous roommate you'll see on most of my Instagram stories) to take one big bite out of whatever I'm photographing so that I can show you what the inside looks like. I photographed what I needed to of these cups and then called her over (she was waiting oh-so-patiently - the "bite pic" is her favorite part of my recipe days). These should have had enough time to thaw after I pulled them from the freezer, but when Grace went to take a bite, she struggled - clearly, the thickness of the hard chocolate layers prevented a smooth, pretty bite for the infamous "bite pic". As I write this, I consider what you, my reader, is thinking, which could likely be along the lines of "why is it that big of a deal to have a couple cracks in that bite? it's chocolate - just eat it!" Exactly, and I will certainly just eat it. Messy food is some of my favorite food, and chocolate is no exception. BUT when I take all of this as seriously as I do, I want a smooth, pretty bite. And the same goes for that thing I'm not quite ready to share here, just yet. I take it seriously because it's something I'm passionate about and it's something I truly do desire. I took a bite and it's not that pretty - it's definitely not smooth, either. Nonetheless, it's SO good. It's creamy, it's sweet, it's creamy, it's satisfying on so many levels. 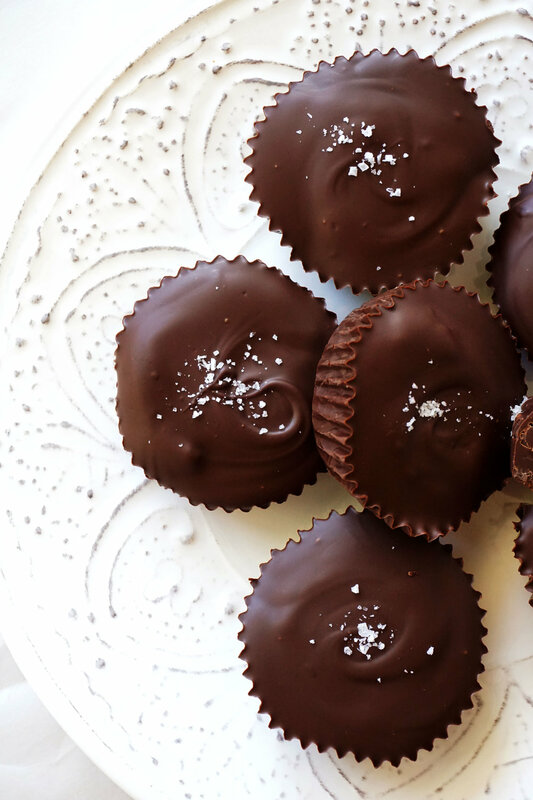 Salted caramel + dark chocolate is a dessert combination that hits. every. spot. for me. These may not be magazine-worthy (at least, not this group of photos, that is), but I love them and other people do, too, and they see the beauty in the hard work I put in. They see it pay off and they know I'm bursting with smiles and passion doing all of this. Sigh. That thing I want is ugly and messy at the moment. It's hard to bite into, sometimes, but it melts in my mouth and in my hands. It's not beautifully put-together and it doesn't even have a name yet - I can't describe to anyone. Only those who know about it know that truth, but they also know how giddy and smiley and indescribably vibrant it makes me. It is what it is. As messy as it is, it is even more satisfying. Savor it. Line a muffin tin with parchment paper cups and set aside. Use either a double-boiler or microwave to melt the chocolate and coconut oil, stirring at intervals throughout to prevent burning. Scoop about one tablespoon of the melted chocolate into each muffin cup and freeze until solid. Keep the remaining melted chocolate warm for the time being. Scoop one tablespoon of the salted cashew caramel into each muffin cup and spread slightly to the sides, but not all the way. Top each with about another tablespoon of melted chocolate and sprinkle with sea salt. Freeze until solid. Serve when ready - be sure, if traveling, to keep them as cold as possible. I recommend storing them in the freezer, then bringing them to about room temperature before serving (let them sit out for 5-10 minutes).